The launch of Guy Kawasaki’s Reality Check: The Irreverent Guide to Outsmarting, Outmanaging, and Outmarketing Your Competition in France, which I translated as La Realite de l’Entrepreneuriat – le Guide Irreverencieux pour Depasser, Devancer, Distancer ses Concurrents gave me the opportunity to reconnect with a man whom all the French Macintosh developers and quite a number of foreign developers trusted and liked a lot, Neil Minkley, a true Brit who followed his father to France as a child, and never returned to live in his native Rotherham, a few miles from Sheffield. 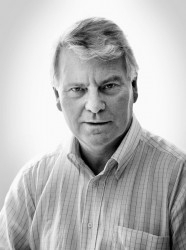 After an engineering degree in Applied Mathematics and a master in Computer Science from the University of Grenoble, Neil joined Bull, where he stayed 12 years, starting as a software development engineer and quickly becoming a “Large Systems Product Marketing Manager.” Moving in 1983 to Apple France was a radical change. The subsidiary had been started by Jean–Louis Gassée in 1981 and was garnering interest quickly. Of course, participating in the launch of the Macintosh in France was ten times more exciting than anything Neil had ever experienced. He was definitely in the thick of it as the Developer Services Manager, which entailed, among other tasks, promoting the Macintosh to third-party software developers and assisting software publishers in their marketing and distribution efforts in France. He was extremely busy, of course, but never behaved as the super-occupied guy that you have to beg to for a meeting. Just like most remarkable people, he had the art and the courtesy of making himself available and was never giving to anybody the impression that he was in a rush. Such kindness is invaluable when you are a new company and look at the manufacturer of the product on which you bet your life as a holy place! His technical background enabled him to analyze products carefully, ask very precise questions, and make relevant suggestions. Very relevant, as far as I am concerned. In 1985, I was walking with him in the yard of Apple France late in the afternoon; the company I had started, ACI (ACIUS in the US in 1987), was still quite small. We had published a game and a file manager, ABCbase, and had begun the development of the first graphical relational database. We didn’t have a name yet, and as I was telling him that we were providing a new dimension in the way to organize and present data, he suggested with his always soft-spoken tone: “Why not 4th Dimension?” And the product was named 4th Dimension – quickly nicknamed 4D by our users. Incidentally, the company also became 4D in 2000. I lost track of Neil in 1993. I left ACI and soon after, ACIUS. Neil left Apple at about the same time and joined Hachette as the Director of a Multimedia Products Division, where he stayed until 2007. Living in the United States, I did not even know that he was the man behind the Hachette Multimedia Encyclopedia, Hachette Multimedia Dictionary and Atlas – I guess one of the first products of the kind. Now, as a consultant, he selects the companies he helps and is dedicated to his students at l’EPITA, a Graduate School of Computer Science and Advanced Technologies located in France, where he recently started to teach Project Management in English. This gives him the opportunity to progressively add information to his Web site: http://www.anglaispratique.fr, carefully thought-out for French-speaking people.